A from scratch Homemade Funfetti Cake is the perfect cake for any birthday or occasion! Fluffy white cake mix is full of sprinkles, topped with a heavenly sprinkle buttercream frosting! However, full disclosure: I’d eat this cake with or without the birthday party! Whew you guys, you are lucky you’re getting a post today. It got to 4pm yesterday and I hadn’t showered yet, so that let’s you know what kind of a day it was. I mentioned on Sunday that I was in the Bay Area for a conference. It was 2 full days of nonstop brain power usage, which was exhausting. On Saturday, a few of us went to San Francisco for the night. We stayed up too late drinking wine and laughing and then got up early Sunday morning so they could fly home. Now I’m home and back at work after really not working for 2 weeks and there’s so much to do. Plus: Saturday night is Jordan’s birthday party night. If you have followed this blog, you’ll know that I set high standards for birthday parties when Jordan was young. There was the rainbow party, the VIP dance party, Annie, and (my favorite so far), the Taylor Swift birthday party. She’s used to elaborate decorations, custom designed (by me) invitations, themed foods and activities and fun (and sleepovers). These started with her third birthday and have gone from there. Piece of advice: don’t do what I did. Start out being that parent that just makes chill parties. Then if you do ever go big the kid will be in awe. Now, I’m stuck. This year is a Stranger Things Party. Hopefully at some point I’ll have a post to share with you. Until then, we can talk about birthday CAKE which is always delicious, especially when there are sprinkles. 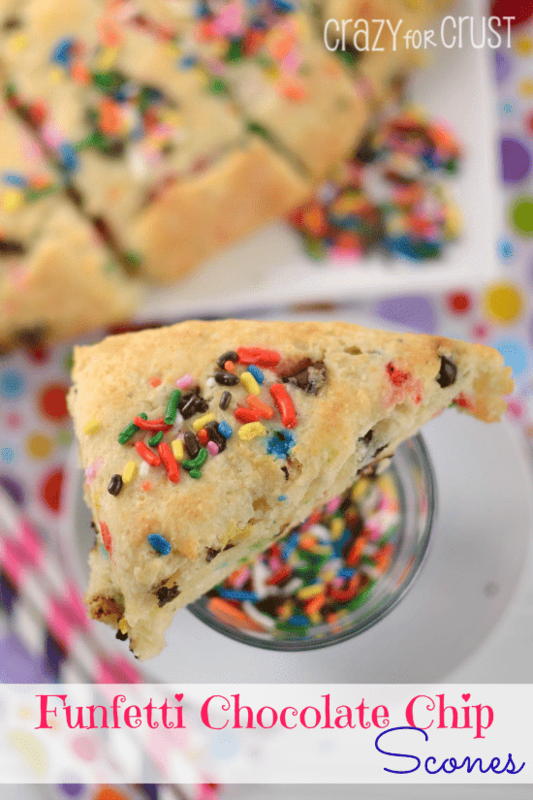 My favorite cake in the world is a sprinkle cake, also known as a Funfetti Cake. You’ve probably seen Funfetti Cake Mix in a box, or you may have heard it called Confetti Cake as well (I think that depends on the brand.) 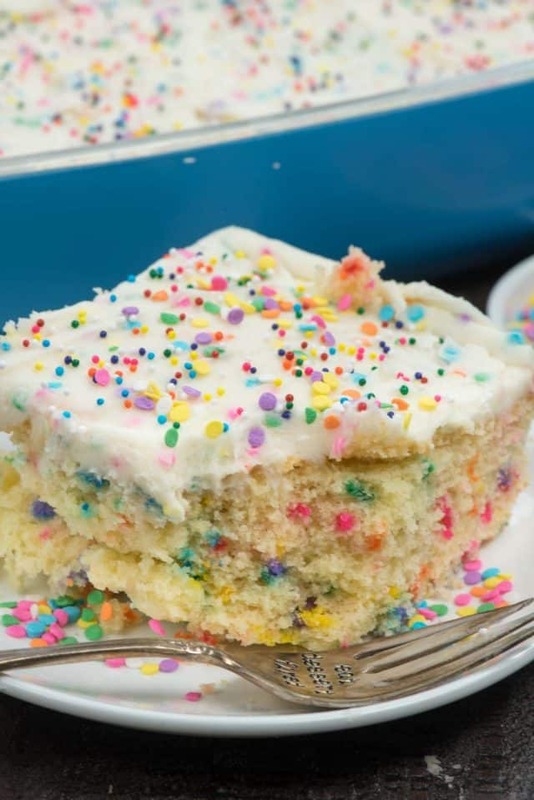 To me, a funfetti cake is basically a yellow cake with lots of sprinkles, and it’s served with a vanilla frosting also full of fun sprinkles. 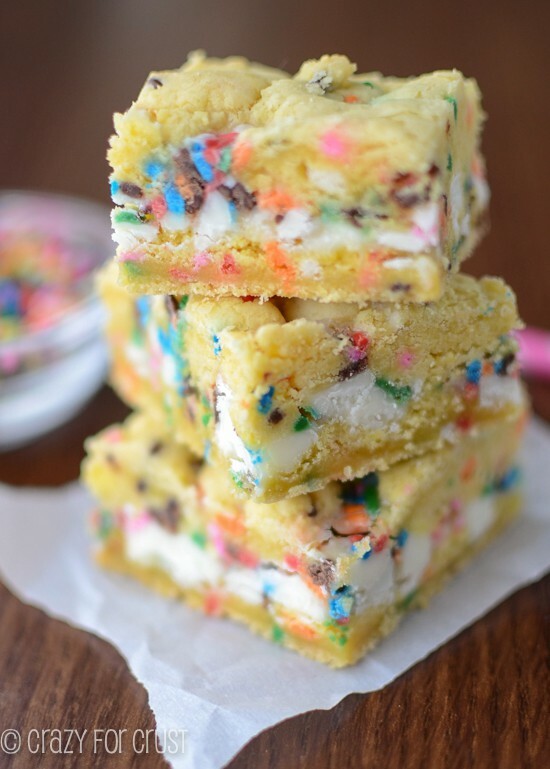 I have a Funfetti Cupcake Recipe I love but I thought it was time to turn them into a sheet cake. Sometimes I don’t want to make a layer cake or a small square or one-layer round cake. I want an old fashioned 9×13-inch cake like my mom used to make, and this cake recipe fits that bill. This is a soft and fluffy cake recipe that’s easy to make and takes zero cake decorating skill. That’s what I love about a sheet cake, although you can make this as a layer cake too, or even cupcakes. Or maybe even turn it into a brownie cake like I did for my last birthday. 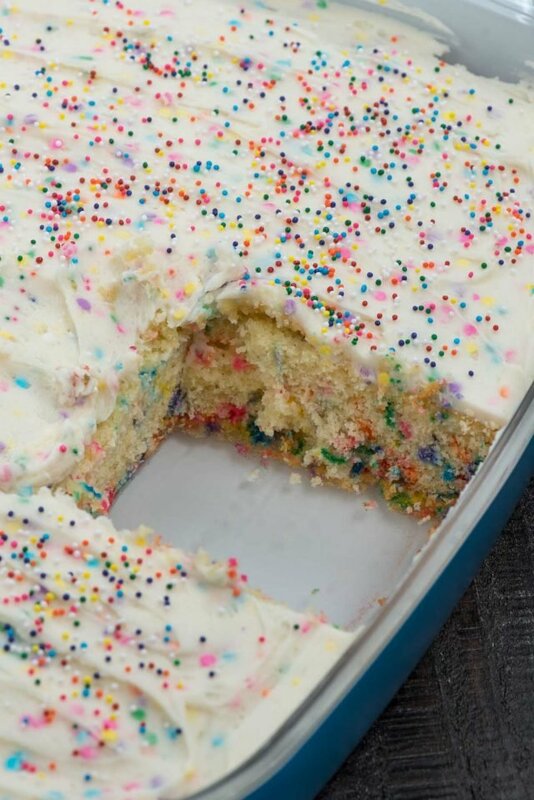 Let’s talk about how to make the perfect funfetti cake and what ingredients you should use. 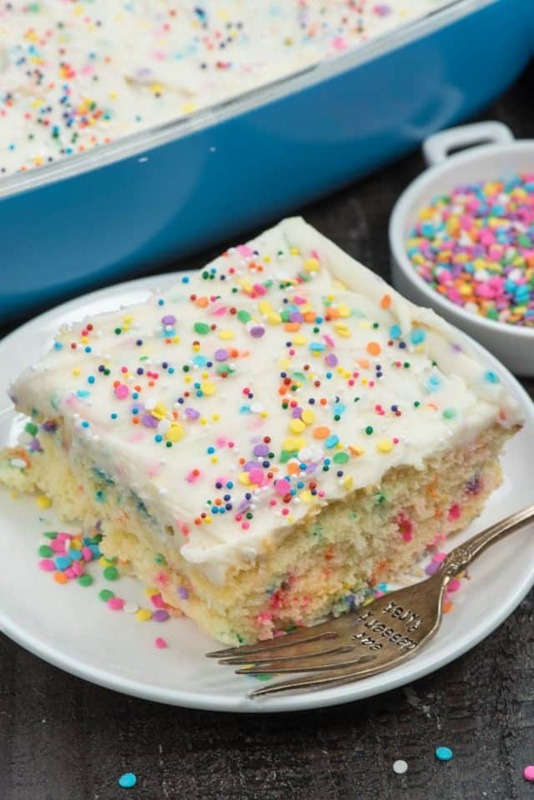 This homemade Funfetti Cake recipe is a moist yellow cake filled with sprinkles and topped with vanilla sprinkle frosting. It’s perfect for a birthday! This cake is a variation of my yellow layer cake that I love so much. 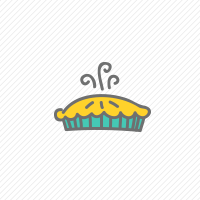 I just upped the butter so it would be extra moist and fluffy. The ingredients call for buttermilk, which I love using in cakes. If you don’t have buttermilk you can make your own by adding lemon juice or vinegar to milk. See the notes for instructions. When adding sprinkles, be sure to use a good jimmie sprinkle for baking. Cheap $1 store ones or nonpareils don’t work – they’ll melt or dissolve. I like buying sprinkles in bulk on amazon and these are what I use. You can also bake this cake in two 8-inch or 9-inch rounds, or as cupcakes. Preheat oven to 350°F. Grease and flour a 9x13-inch baking pan. Whisk flour, baking powder, and salt in a medium bowl. Set aside. Mix butter and sugar on medium speed in a large bowl using a hand or a stand mixer until smooth. Mix in eggs one at a time, then mix in vanilla. Add the buttermilk alternately with the dry ingredients, mixing between each, starting and ending with the buttermilk, and mixing just until the batter comes together. Stir in sprinkles. Pour batter into prepared pan. Bake for 30-40 minutes or until a toothpick comes out with just a few crumbs sticking too it. Cool completely before frosting. To make the frosting: beat butter with a hand or a stand mixer until creamy. Slowly add in powdered sugar, 1 cup at a time, until a crumbly mixture forms. Mix in vanilla and salt, then add 2 tablespoons heavy cream. Mix until smooth, adding more cream until you reach your desired consistency. Stir in sprinkles. Frost cake with frosting and top with more sprinkles. Store loosely covered for up to 2 days. Also makes 24 cupcakes or two 8-inch rounds. To make your own buttermilk, add 1 teaspoon vinegar or lemon juice to a measuring cup then fill with milk to make one cup. Let sit for 5 minutes. If you love sprinkles and cake, be sure to check out my list of Funfetti Recipes as well as my round-up of Funfetti Recipes from my favorite bloggers! And be sure to check out Julianne’s Funfetti Cream Pie Cupcakes, Deborah’s Funfetti Frosting (OMG! ), and Stephanie’s Funfetti Brownies! Always ready for some birthday cake!!! With parties and entertaining of any kind, you have impeccable standards and don’t miss one single thing! Every detail is perfect! Happy early Bday to Jordan and good luck this weekend with her party! How long do you bake the CUPCAKES? Thanks.